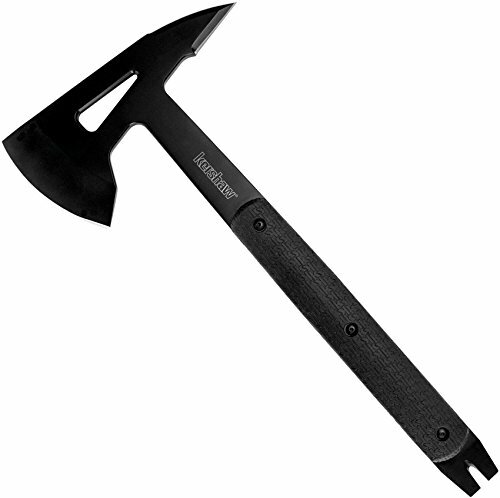 As a member of the axe family, the best tactical tomahawk can be a vital addition to any survivalist’s kit. It’s also a versatile tool for anyone heading into the wilderness, or even simply with a variety of home maintenance tasks to hand that requires a reliable approach. Why Choose a Tactical Tomahawk? 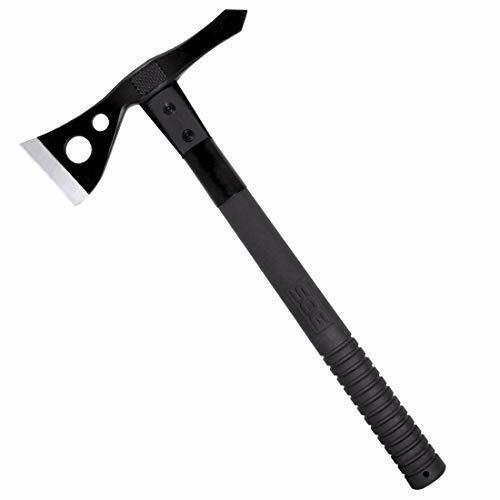 The long lists of tasks you can accomplish with a good tomahawk is second only to the small size, convenient carry shape and light weight of these versatile tools. There’s a reason they’ve become a cinematic trope for survival situations. For anyone who wants to be prepared, it’s one of the most useful tools and weapons you can have in hand. From chopping wood, hunting and opening containers to breaking your way out of buildings, defending yourself, and breaking glass, the lists of practical tasks a tomahawk will help you with is almost unending. Aided in part by the light and portable design, this makes them a must for any survival bag or well-stocked toolbox. Tactical tomahawks seek to combine the versatility of use, they will often feature spike or knife backs and pry-bar handles to allow for maximum options in a minimum package- with lightweight construction. Lightweight, however, doesn’t mean weak. The construction of a good tomahawk will be perfectly balanced to make it a strong, durable tool in your hands while maintaining a weight that doesn’t kill your muscles as you carry it. Most will ship with their own carry bag, and many can be carried by lanyard as well as in the hand. It’s important to be sure that the design you choose meets the tasks you most expect to need well. It should offer a blade large enough for the chopping work you anticipate doing, with a firm strong handle from which the head cannot realistically separate easily. The handle needs to be tough and durable without adding excessive weight to the design. Cutaways that are properly placed will help lighten the load without destroying the strength of the axe head. A good, grippy handle is a must, and some form of anti-corrosion on the steel is always useful although not essential. Rust can be polished away, and if you care for your tools right it shouldn’t even occur, but it would be simpler for you if the care and upkeep of the tactical tomahawk were a little easier. Above all, it should have a handle design and axe head balance you feel comfortable wielding. 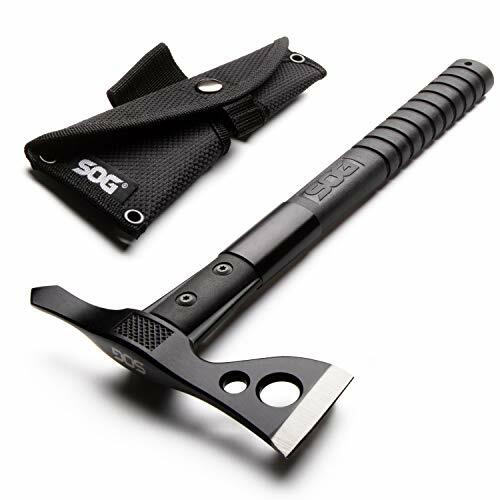 If you’re looking for a versatile and reasonably light choice for all your obstacle removal, extraction, breaching and excavation needs, the SOG tactical tomahawk may well be the right tool for you. 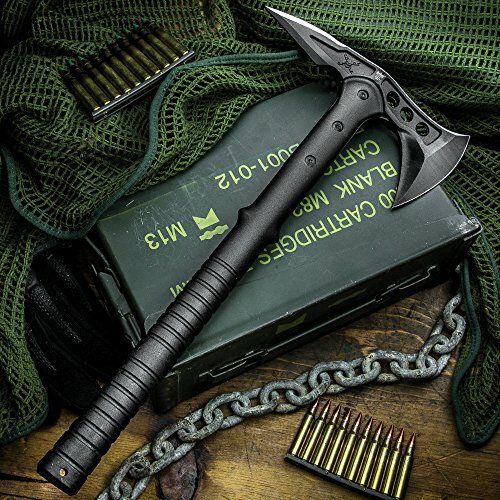 The tough ballistic polymer of the handle offers a 2.75-inch axe head of stainless steel, and the overall design is reminiscent of a successor to the Vietnam Tomahawk. This particular unit has a lifetime warranty, too. 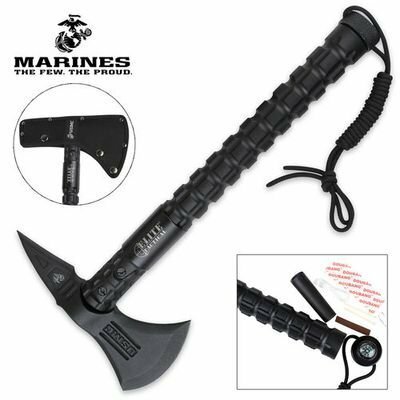 Officially licensed, this military style tomahawk makes a perfect companion to your less violent daily exercises too. It incorporates a fishing kit and end-cap compass too, and ships with a lanyard and nylon sheath. Material: Reinforced Nylon and stainless steel. Lightweight with an upwards sweeping blade ideal for chopping, slashing and cutting, this fierce little tomahawk is a great companion for all your needs. The back of the blade is also sharpened for chopping and hooking. 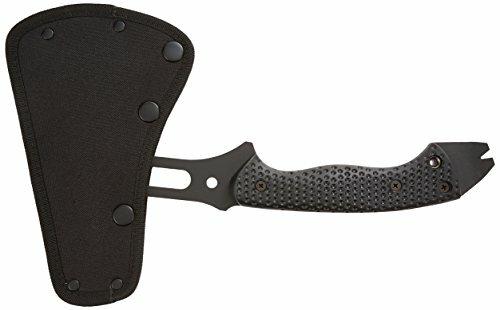 This spike and axe head combination makes it a great personal defense tool as well as ideal for breaching walls etc. The blade is secured with three bolts, and the shaft nighs on indestructible. Material: Anodised stainless steel, fiberglass reinforced nylon. Another knife/axe blade combo, the knife on the Kershaw siege tomahawk does not fold flat, and it’s important to remember this will affect its storage capabilities. The handle can also be used as a pry bar, with the head fully riveted on. If you need a handy and relatively light multi-tool, you can’t go wrong with this one. Made to act as a lighter option then the SOG Tactical Tomahawk, this versatile 2” blade provides all the same functions as its bigger cousin. It’s corrosion resistant and tough for almost any function. The handle has a built-in slip-resistant grip for safety. Combined with a unique, futuristic style, it’s a firm winner. Another three in one tool, the handle can be used as a pry-bar and the spike back for a host of other purposes as well as the strong axe blade. Strategically place hollow-outs in the blade allow for excellent leverage when breaching. Gun cote ensures that the axe never slips in your hands. 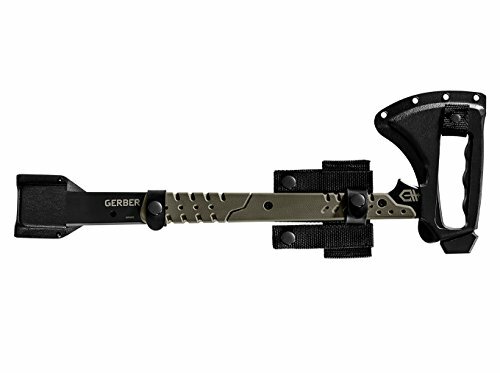 Allowing a range of actions from pulling nails to hacking down branches, the powered coated head and full tang will take you wherever you go, doing whatever’s needed on the way. With the Schrade, you are covered. Material: Powered coated stainless steel, glass filled nylon handle. When shopping for the best tactical tomahawk, quality of construction is vital, with design and function a close second. With all of these great tomahawk designs, you’re sure to find the perfect one for your needs and budget.